It's time to cool off and relax with this combination water bottle and massage roller. According to the traditional Hindu system of medicine, the Water Element nourishes our self, soothes and softens us, and protects us from damage. This body-conscious bottle seeks to do the same thing for you. 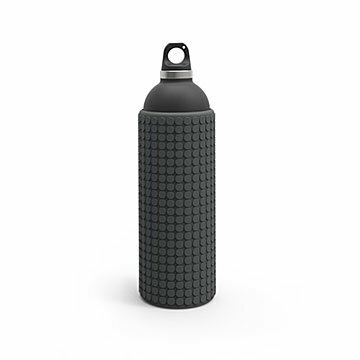 Not only does the double-walled, insulated bottle keep water at the ready when you're on the go, but it also has a textured, high-density foam sleeve that transforms the bottle into a portable massage roller for those overworked muscles and joints. Such a mindful multi-tasker will be especially welcome at the gym or yoga studio, or even at work after a taxing commute. The sleeve is removable for easy cleaning, and the stainless steel bottle can keep 25 ounces cool up to 24 hours, or hot up to 12. Made in China. 11" H x 3.25" Dia; Holds 25 oz. Hand wash only. Foam sleeve can be removed to hand wash separately. It's the perfect sized water bottle. The water bottle is big, but not unwieldy. As a foam roller it works really well. And the sleeve slips on and off easily, so washing the water bottle is no problem. Got this bottle as a gift for a hard to buy for coworker-and he loved it! Great for rolling. Really works so well! I got this as a bit of a joke but now I steal it from my girlfriend when we go on trips. It's a really effective roller! I was worried this would be really bulky but it's not. It holds a good amount of water but still fits in my cup holder and is small enough to easily travel with. Because it's diameter is smaller than the average foam roller you actually get a bit of a deeper massage, which is nice. Really great overall!